Expensive Or Cheap Photography Gear – Does It Really Matter? Is Expensive Worth It? This will likely not be the only post of 2016 on this topic because it is an ongoing conversation in the photography world: Gear! In particular, opinions on buying expensive gear or cheap gear and comments on YouTube videos about not being able to afford a piece of gear being shown in the video. 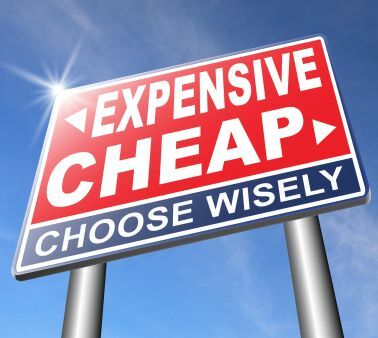 The comments often come across in a negative way from those who think a particular piece of gear is expensive. Sadly, this will not stop anytime soon, so maybe this post will help change your opinion of how you think about expensive vs. cheap photography gear. Here's the bottom line: Do the best you can with the photography gear that you can afford and stop whining about and wanting expensive gear if it's NOT within your budget. In order to buy gear that is more expensive, you have 4 core options: 1) Never get it. 2) Save for it. 3) Go in debt for it (not recommended). 4) Price your services high enough but fair enough and buy a new piece of gear when the big projects come through. Complaining about not being able to afford certain gear to fellow photographers and commenting negative on YouTube videos or forums only makes you look bad. Sometimes it really is best to keep your opinion to yourself. Try doing it and see what you think. Yes, I have bought cheap gear and still own some of what I would consider cheap gear, but I have learned several things about cheap gear. Cheap photography gear is often not as consistent as expensive gear. It sometimes doesn't work correctly. It sometimes doesn't provide the same results as photography gear that costs more. It doesn't last as long as photography gear that costs more. 1) A $5 shutter release trigger for my 5D Mark III off of Ebay. At $5 each, I bought several. They all work great. Also, at $5, if it stops working, I'll just throw it away. Guess what? NONE of them have stopped working. 2) A $50 quick setup octabox off of Ebay. It's not made to breakdown and setup on a regular basis. I had two of them and they both ripped over time with breakdown and setup. One is now in the trash and the other will be carefully used. Solution: Leave it set up all the time or buy a nicer one. I love the way my Profoto Octabox is made. 3) Lenses - This is where trying to save money can bite you big time. There are a few exceptions like a 50mm f/1.8 prime vs. the more expensive 50mm f/1.4 prime which you'd be hard pressed to see the difference in. However, when it comes to zoom lenses like a 70-200mm f/2.8 compared to 3rd party brands or less expensive Canon zooms, you will likely notice the difference in results and in build quality. It's OK to try cheap on a few things, but ALWAYS buy the best lens that YOU CAN AFFORD. Buying Expensive Photography Gear - Is It Necessary? The short answer to "NECESSARY" is that buying expensive photography gear may not be absolutely necessary, but it can and does often make a difference in the quality of a photographers work. There are two core reasons that full time professional photographers often use professional photography gear: 1) It often lasts longer. 2) The results are often better. It seems to me that some photographers are almost angry that they cannot buy X, Y or Z. Although I kind of get it, I also kind of find it disturbing. At the end of the day, expensive is in the eye of the beholder. For example, do you see the Canon 6D Body Only at $1,399 expensive or the new Canon 5DS at $3,399 expensive? Maybe to you, the Canon EOS Rebel T6i DSLR Camera with 18-55mm Lens for $749 is expensive or all that you can afford. (Current pricing the gear mentioned subject to change.) It's all relative to your personal perception. Expensive to one photographer may seem cheap to another. I can honestly say that most of the time and I mean like 99% of the time that buying a more expensive piece of gear is better in the long run. For example, I'm on the go a lot with my gear. I have found that better quality gear seems to hold up longer. If I had to replace a $50 octabox too often like I mentioned in the cheap gear section, it would eventually equal or exceed the cost of something more expensive. You have to decide what's right for you and your budget. But don't be that photographer who bad mouths expensive gear on a regular basis. Do the best you can with what you've got and that's all you can do that will really make a difference in the end.